The Fujifilm X-H1 is certainly an interesting camera, but is it right for you? I have had a little time to go over all of the features and made the above comparison chart for FujiAddict readers. As predicted the Fujifilm X-H1 is strongest as a video camera, but it does have a few big and small improvements over the Fujifilm X-T2. Some care about IBIS a lot and if you do the X-H1 is for you with up to 5.5 EV of stabilization, but image quality should be basically the same as the Fujifilm X-T2. The Fujifilm X-H1’s IBIS system uses three-axial acceleration sensors and a dual-processor to measure about 10,000 calculations per second. This requires the camera to be built to twice as high of a degree of precision as a conventional camera. The IBIS system also partially relies on the electronic first curtain shutter of the X-H1 and might benefit from the roughly 25% thicker magnesium body than the Fujifilm X-T2, which is already very well built. When shooting video the IBIS, Flicker Reduction Mode, ETERNA, built-in high-performance microphone, Cinema 4k, internal F-log and higher 200Mbps bitrate will all help the Fujifilm X-H1 outperform the Fujifilm X-T2. The X-T2 is a competent video camera, but the X-H1 is just a cut above the X-T2 and the extra build quality and larger grip will help with larger cinema glass. Some of the video features of the X-H1 might be patched into the X-T2 later, but it’s more likely that Fujifilm will focus on the X-T2’s photography features since the cameras are more similar as digital still cameras than video. 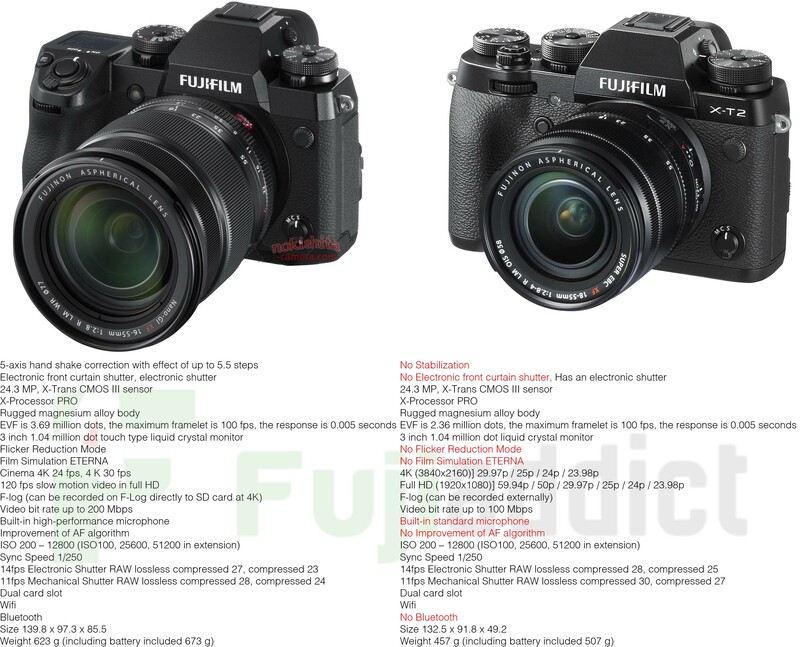 As for photography, the Fujifilm X-T2 has a slightly better buffer than the X-H1 according to the leaked Fujifilm Specs. The AF algorithm might be better on the X-H1 for now, but Fujifilm will likely add it to the X-T2 in the future. They might even add Electronic First Curtain, Flicker reduction mode, and ETERNA in the near future too, via a firmware update. The only long-lasting advantage the X-H1 will have is geotagging via Bluetooth, which the X-T3 will have when it’s announced at Photokina and a slightly better EVF. Join us for our live blog on February 15th. Make sure you join our new Fujifilm X-H Group and Fujifilm X-H Page on Facebook. Also, don’t forget to sign up for notifications via the red bell on the site and follow Fujiaddict on Facebook and Twitter. This entry was posted in Fuji X-T2, Fujifilm X-H1 and tagged Fuji Rumors, Fuji X-H1, Fuji XH1, Fuji XT2, Fujifilm, Fujifilm Rumors, Fujifilm X-T2, Fujifilm XH1, Fujifilm XT2, FujifilmRumors, Fujirumors. Bookmark the permalink. Trackbacks are closed, but you can post a comment.